The continuing rapid development of materials science and engineering is graphically reflected in the 130 articles in this second Supplementary Volume to the highly acclaimed Encyclopedia of Materials Science and Engineering. Under the guidance of a distinguished Editorial Advisory Board, Professor Robert Cahn has commissioned over 160 authorities worldwide to provide new articles in the expanding areas of composite materials, advanced and traditional ceramics, electronic and superconducting materials, elastomers and polymer applications, wood and paper, industrial minerals, materials characterization, surfaces and interfaces, fundamental physical metallurgy and metals processing, production and fabrication. All articles are extensively cross-referenced, subject-indexed and provided with select bibliographies for further reading. Special features of this and subsequent Supplementary Volumes are a cumulating analytical table of contents and subject-index which together will enable the reader to access information in the current or previous Supplementary Volumes without reference to earlier tables of indexes. Complete alphabetical lists of titles and contributors are also provided. 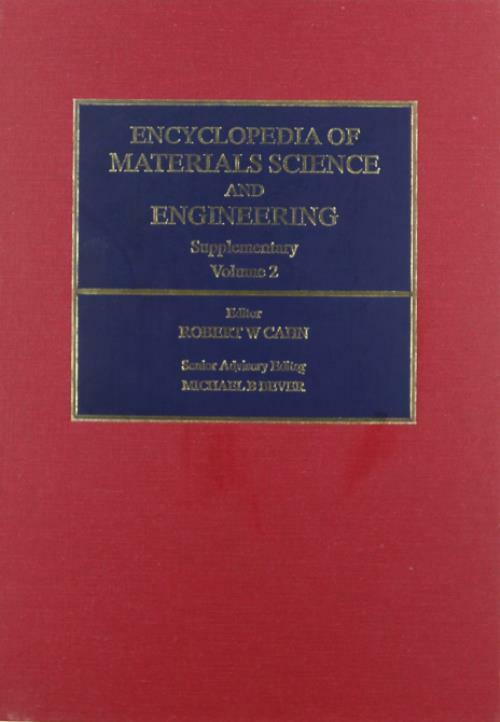 The continuing publication of biennial Supplementary Volumes will ensure that the Encyclopedia of Materials Science and Engineering remains the single most comprehensive overview of recent research and development in all aspects of materials science and engineering. Selected Articles: Adhesives for wood: an update. Aluminum-based glassy alloys. Aluminum nitride. Armor, ceramic. Armor, composite. Automotive composite components: fabrication. Biomaterial--blood interactions. Biomaterials: surface structure and properties. Carbon-fiber-reinforced plastics. Ceramic cutting tools. Ceramic powders: chemical preparation. Ceramics: construction applications. Coal: world resources. Colloidal crystals. Composite materials: aerospace applications. Composite materials: fatigue. Composite materials: structure-performance maps. Computer simulation of microstructural evolution. Dental elastomers: an overview. Diamondlike and diamond thin films. Diffusion in silicon. Fiber-reinforced ceramics. Fumigation of wood. Gas sensors, solid state. Health hazards in wood processing. High-level radioactive waste disposal: safety. High-resolution electron microscopy. Hydrogen as a metallurgical probe. Insulation raw materials. Lignin-based polymers. Lime. Microengineering of materials: laser fusion targets. Natural-fiber-based composites. Nitrogen in steels. Oxidation of molten metals, directed. Petroleum resources: world overview. Physical aging of polymers. Plywood. Polyethylene processing to produce ultimate properties. Portland cement raw materials. Quasicrystals. Scanning tunnelling microscopy and spectroscopy. Silicon: preparation for semiconductors. Specialty papers from advanced fibers. Steels for rolling bearings. Superconducting device fabrication. Superconductors, ceramic. Superconductors: magnetic structure. Thin films: X-ray characterization. Titanium aluminides. Welding of thermoplastics. Wood: surface chemistry. 550 line drawings and photos and 100 tables.